During the holiday season, friends and family travel near and far to spend some time with their loved ones. 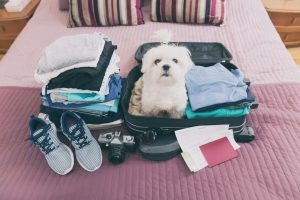 While some families choose to find a pet-sitter or board their animal, others decide to include their pets in their travel plans. Before you travel with your pet for the holidays, follow these tips. Is your pet a seasoned traveler, or is this the first time? Make sure your animal is in good enough health to travel, especially if they have never done so. Pets can get motion sickness just like humans, so find out if your pet can handle a long car ride or plane ride. If you have a cat, they might be more sensitive than your dog. If your trip is a car ride, it is recommended that you restrain your pet. This is safer for your animal, and many different harnesses are available. Make sure you have an easy way to give your animal water, and don’t forget to stop to take them on walks throughout the drive. Bring everything you might need for the drive including familiar bedding and toys. Your pets will be in a new environment, so provide some familiarity. If you are flying, you will need to check the flight rules for your airline. Make sure you double check that all your papers are filled out and that you have the proper documentation for health papers and vaccinations. Check out the weight limits for your airline as well. If possible, travel on a less busy day. Airports can be overwhelming, and the holidays are one of the busiest times of the year. Wherever you end up after your long travel, try to keep your pet as comfortable as possible. Pack all the necessary items that will keep them happy. Bring the right food, or make sure that your destination has a store that sells the brand you use. The last thing you want is for your pet to be sick during your holiday vacation. If you are bringing a cat somewhere during the holiday season, make sure to have a litter box they can use. Bringing your pet along for the fun doesn’t have to be stressful if you are prepared.